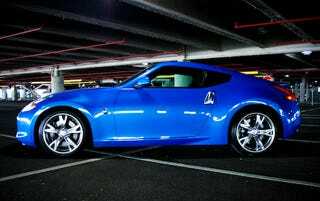 Yesterday, we told you that the 2009 Nissan 370Z uses technology to boost driver involvement. Let's pick apart the Z's new technological bits, piece by piece. For reasons we don't really understand, the 370Z's styling is strangely controversial. We think it's a hugely successful reinterpretation of the 350Z's basic proportions, now adding references to the original 240Z in the cantilevered roof. Referencing history rather than shamelessly copying it like the three American muscle cars. Details like the wildly flared fenders, harpoon headlights and silly door handles are a bit much viewed independently, but somehow combine to create a very appealing whole. This is where you feel the pinch, literally, of the swoopy exterior. While forward vision is extraordinary for a front-engined car, rear vision is virtually nonexistent and the blind spots over your shoulders are huge. I had to crawl into the trunk to find an angle from which I could see out of the dinky little rear 3/4 windows. Over the 350, material qualities and the design has improved considerably, but the Gameboy graphics-inspired clocks and over use of the Z logo are still pretty tacky. Ignore all that though, because the Z nails the fundamentals - supportive, manually adjusting, heavily bolstered seats and a good relationship between the wheel, pedals and gear lever. We just wish the steering wheel telescoped, because we can't quite achieve the wheel-in-lap driving position we prefer. Pack light, there's not much room. 4.7 seconds to 60 MPH is damn good for a $30k sports car. Peak torque (270 Lb-Ft) arrives at 5,200 RPM and peak power (332 HP) at 7,000. That might not sound hugely flexible, but there's now plenty of power and torque throughout the rev range, meaning overtakes can be achieved without downshifts. Alternatively, downshift for the full experience anyways. Unlike a lot of modern engines, the power actually tapers off before the redline, meaning you won't find yourself constantly hitting the rev-limiter, thank you Nissan. 14-inch discs up front and 13.8 rear on the Sport pack are reassuringly powerful and fade-free. Pedal travel isn't too long like in most passenger cars, nor too short as in some performance vehicles. The relationship with the throttle for heel and toeing is pretty good and the SyncroRev Match really helps smooth heavy deceleration. Better than the old model, but you're still riding in a stiffly sprung performance vehicle with optional 19-inch wheels and low-profile tires. High quality components in the suspension and fairly light forged aluminum wheels help a lot, low unsprung weight FTW. Also better than the old car, the 370Z is responsive, communicative and neutral - neither understeer or oversteer is hugely apparent. Hardigree and a few others have expressed concern that the Z is no longer really involving. The problem there is that it's very capable and the summer performance tires have an awful lot of grip (instrumented tests have reported in excess of 1 g on skidpads). Experienced performance drivers will find this rewarding, but those with a little lower skill level would probably do better in a car with narrower tires but an equally good chassis. Take a look at the Hyundai Genesis Coupe if you meet that description. Shifts are slick and short and clutch effort is a bit firm, but predictable. Combined with the SyncroRev Match system that perfectly heel-and-toes for you on every down shift and this is one of the best 6-speeds in the business. The basic stereo is, well, basic. The bass is a little distorted and too strong and the overall cabin acoustics aren't exactly conducive to good sound either. Having said that, the exhaust note and intake roar sound damn good, but aren't quite up to 2010 Mustang GT levels of excitement. The SyncroRev Match is really the only toy here, but it's a good one. Just focus on driving, not playing with stuff in the cabin. It kind of depends on what you're looking for. $32,930 for our Sport pack-equipped car is a hell of a bargain considering how fast and capable the Z is, but it's an impractical car with only two-seats and very little luggage space. That's a criticism that could be leveled at any two-seater. The Hyundai Genesis Coupe now offers most of the Z's performance in a more practical four-seat package with a real trunk for a few grand less. With the launch of the 2010 Camaro SS, 2010 Mustang GT and Hyundai Genesis Coupe, the Z has never faced stiffer competition, but the 370 has again raised the bar for performance coupes. Most people will probably argue that it's not fair to compare those cars to the Z and it isn't; it's much more capable than they are. Combine that performance with the new looks, new-found refinement and the sheer attention to detail found in the oily bits and shoppers looking for a fast, exciting car that they can just about afford need look no further.